The UN human rights chief has welcomed the efforts of senior Muslim figures to restore calm amidst violence related to an anti-Islam film and cartoons, and highlighted how ignoring such “provocative” products can be the best way to deal with them. This week, the French magazine Charlie Hebdo published cartoons seen as denigrating to Islam, and which have led, in response, to concerns over the possibility of a violent reaction to them, with the French Government reportedly banning any street protests against the publication. The cartoons come in the wake of violence in Libya and elsewhere in the Middle East, starting last week, in response to an anti-Islamic video produced in the state of California by a US citizen. The film has drawn widespread condemnation around the world, including from Secretary-General Ban Ki-moon, as well as Ms. Pillay. According to media reports, at least 30 people have been killed in the violence, and fresh protests broke out on Friday in countries across the Muslim world. The spokesperson noted that High Commissioner Pillay said she fully understands why people wish to protest strongly against the film and the cartoons, and it is their right to do so, but peacefully. The High Commissioner has also urged religious and political leaders to make a major effort to restore calm, and welcomes “the fact that a number of senior Muslim figures have been making similar statements about the need to rise above the provocations,” Mr. Colville said. 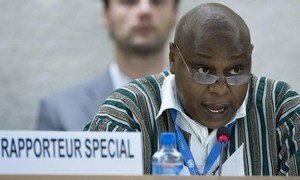 An independent United Nations human rights expert today condemned the violence that has been taking place in numerous cities across the world in response to an anti-Islamic film, and warned that protest demonstrations and rallies must be peaceful in order to be protected by international human rights law.